Our dog wardens have picked up a number of strays recently; their owners have not been to collect them which has resulted in our kennels at Westerleigh becoming full. 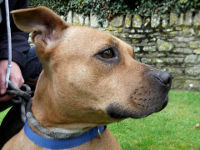 We have picked up a number of Staffordshire bull terriers like Katy, pictured, as well as many other dogs who are staying in our kennels. In order to re-home a dog, a home check will be carried out and you must have a secure garden.